Our "Ava" flower is a gorgeous rose that shimmers with iridescent sassy sequins. 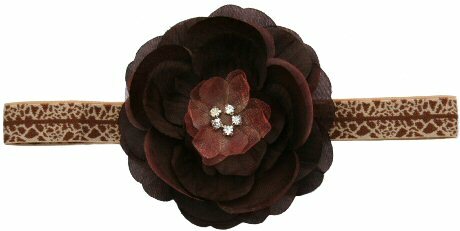 It measures approx 4 inches and is fastened to an elastic headband. Our elastic headbands are 5/8 inches wide. They keep their elasticity and are soft and silky to the touch. Our "Brooke" flower has layers of delicate chiffon and fabric petals that surround five brilliant radiant rhinestones. 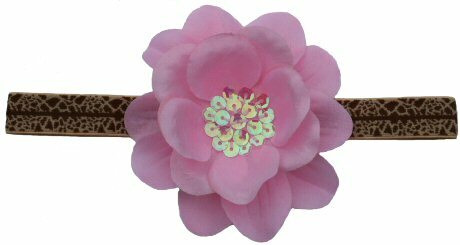 It measures approx 3 1/2 inches and is fastened to an elastic headband. Our elastic headbands are 5/8 inches wide. They keep their elasticity and are soft and silky to the touch. 2010© www.poshmalibucouture.com All Rights Reserved.